Sounders defender Chad Marshall, pictured in a 2016 match, has been chosen for the MLS Best XI for the fourth time in his career. The 34-year-old, who came to Seattle in a December 2013 trade with the Columbus Crew, also made the Best XI team in 2008, 2009 and 2014. 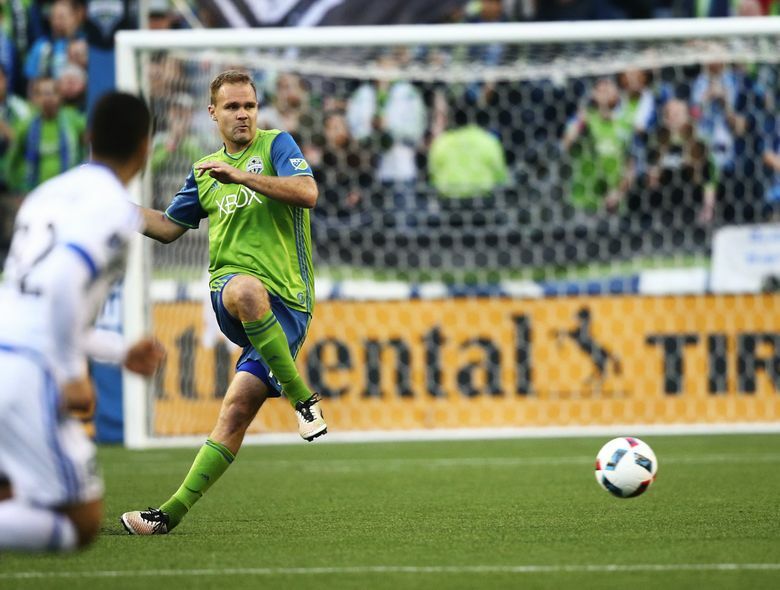 NEW YORK – Sounders defender Chad Marshall has been selected to the MLS Best XI team for the fourth time in his career. Marshall, 34, also earned Best XI honors in 2008, 2009 and 2014; in each of those three years, he also was voted MLS Defender of the Year. The Sounders acquired the 6-foot-4, 190-pound Marshall in a December 2013 trade with Columbus. The rest of the 2018 Best XI team: forwards Josef Martinez (Atlanta), Wayne Rooney (D.C. United) and Zlatan Ibrahimovic (Los Angeles Galaxy); midfielders Luciano Acosta (D.C.), Miguel Almiron (Atlanta), Ignacio Piatti (Montreal) and Carlos Vela (Los Angeles FC); defenders Kemar Lawrence and Aaron Long (both New York Red Bulls), and goalkeeper Zack Steffen (Columbus). Rooney made the Best XI despite playing just a half-season after joining D.C. United. The English forward, who turned 33 last month, made his MLS debut July 14 after leaving Everton and scored 12 goals in 20 games. He has 53 goals in 119 international appearances and is scheduled to make his England finale on Thursday in an exhibition against the United States at Wembley in London.